Policing was at the centre of the debate on H&F Council’s budget last week. During the last two years H&F Conservatives have only provided a mere £750k per year in police funding out of a total £189m budget - which is far less than they spend on their advertising, PR and propaganda programme. This funding provided 24/7 police cover in just two of the borough’s sixteen wards. During last Wednesday’s budget debate I told the Conservative Administration that an incoming Labour Administration would deliver more investment, provide more police and cover all of the borough's wards with extra 24/7 Police Task Squads by the end of our first term. Something they have failed to do. In 2006, the Conservatives initially cut all Council funding to the Hammersmith Broadway police team causing a 25% reduction in police numbers. My fellow ward Councillors and I worked with residents and local businesses, such as Stenton Butchers, and successfully campaigned to have the ward’s police numbers restored - which was eventually funded from a none Council source. However, we're campaigning with residents for more police to provide 24/7 cover for the area. Now, after a highly public three year campaign (click onto the latest leaflet) the Tories have given in and offered another £404k which will give Hammersmith Broadway 18 hour Safer Neighbourhood Team cover for six out of the seven days in a week. 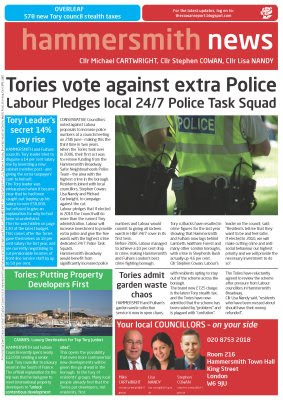 While it is good to know that our campaign is working this is not the 24/7 Police Task Squad we've been campaigning for; it leaves thirteen of the borough's sixteen wards without any extra police whatsoever; and it is not enough to deliver the big falls in crime that I know the public and the police want to see. Cllr. Lisa Homan (Lab), the Shadow Cabinet Member for Crime & Anti-Social Behaviour underlined what would happen if the public elect us to form the next Administration after the local elections in 2010, saying "Hammersmith and Fulham was the leading crime fighting borough in London under Labour. Now, under the Conservatives it is languishing behind Lambeth, Waltham Forest and even Richmond. The Conservatives actually spend more of the Council's budget on advertising, PR and propaganda than they do on policing. That can't be right and it doesn't reflect the public's priorities. We will change that, if elected to form the new Administration next year and commit to providing the necessary investment to ensure all sixteen wards in the borough gain extra 24/7 Police Task Squad cover". So our campaign continues as I highlighted last week when I told the Tories to “Read my lips, we will do more than you to fight crime” if Labour wins the local elections in Hammersmith and Fulham in May next year. When i go in to hammersmith on a friday night i don't see no police officers. Labour need to win H&F next election in 2010.